Preliminary support is available at https://worklogassistant.com - please try it out and leave your comments. we're still on 3.x, but will eventually go to 4.0. What will this look like? Can we create a new subtask when we submit work against a ticket, or assign the work to an existing subtask? Can you elaborate on why you find that behaviour useful? Those are the two things we're likely to do (obviously this is dependent on our workflow). Our development work is all done in subtasks and sometimes it would be reasonable to create a different subtask rather than work on the assigned one. For instance, if one has to work on the database and the web app to fix an issue, those are two subtasks. It would be useful to be able to create the subtasks from WLA. Another case would be when we're assigning issues to sprints. We move the tasks to "Sprint Backlog" and create a subtask for doing the work. That could be done in WLA. Those are the two things we're likely to do (obviously this is dependent on our workflow). Our development work is all done in subtasks and sometimes it would be reasonable to create a different subtask rather than work on the assigned one. For instance, if one has to work on the database and the web app to fix an issue, those are two subtasks. It would be useful to be able to create the subtasks from WLA. Another case would be when we're assigning issues to sprints. We move the tasks to "Sprint Backlog" and create a subtask for doing the work. That could be done in WLA. If so, I think this would fit within the scope pretty well. So when you say "it would be useful to create the subtasks from WLA", do you mean you'd like to be able to create a subtask for an existing task by (say): * Right-click issue in ilist * Select "Add sub-task" * Have WLA launch the browser as is done for the "Add issue" action If so, I think this would fit within the scope pretty well. I'm evaluating WLA and testing green hooper, typically a user story has many sub-task, and WLA is not showing these sub-tasks to log the work done. It is showing only the user story. Are you planning to add support to log work on sub-tasks in a near future? It is pretty critical for us. Hi, I'm evaluating WLA and testing green hooper, typically a user story has many sub-task, and WLA is not showing these sub-tasks to log the work done. It is showing only the user story. Are you planning to add support to log work on sub-tasks in a near future? It is pretty critical for us. Hi Gerardo, sub-tasks are planned but no time frame yet. I’m thinking this is important. Support for subtasks is also critical for us. I'm interested to know where this is in the development queue. Hi Michael, at the moment this is a V2 feature but V2 does not have a time frame. A small suggestion. Exporting the parent summary and parent key through the plugin would already be a great help. That way we can add this information to the task list box. There is a way I could do this by modifying the server-side plugin. Is this what you were thinking of? Exactly. It is a workaround until v2 is released F.
This reply was removed on 2010-11-25. Any idea when you could get the parent summary & key served by the server side plugin ? It is exposed through the server-side plugin as discussed above. Hi Francis, Try the latest beta: http://next.worklogassistant.com It is exposed through the server-side plugin as discussed above. Hi Sohail, Do we need to update the server side plugin or just the client to try this? Hi Michael, you need to update both. The parent column is available. Hm, that's quite strange. Can you show me a full screenshot? You can send it to sohail@worklogassistant.com . To come back to the original purpose (or so I hope). I would like to get an organized overview as in the jira greenhopper taskboard where subtasks are grouped/indented to their stories? This would enable me to actually use worklog assistant since we are using SCRUM. To come back to the original purpose (or so I hope). I would like to get an organized overview as in the jira greenhopper taskboard where subtasks are grouped/indented to their stories? This would enable me to actually use worklog assistant since we are using SCRUM. It could be possible now, I'll look into it. This reply was created from a merged topic originally titled [WA2] Parent ticket number is missing from field list.. I just upgraded to WA 2, but cannot show the parent ticket numbers for my tickets as columns. Some of the subtasks have the same name but are subtasks on different parent tickets, so this is a necessity. <em>This reply was created from a merged topic originally titled <a class="notranslate" target="_blank" href="http://support.worklogassistant.com/somanisoftware/topics/-wa2-parent-ticket-number-is-missing-from-field-list">[WA2] Parent ticket number is missing from field list.</a>.</em> I just upgraded to WA 2, but cannot show the parent ticket numbers for my tickets as columns. Some of the subtasks have the same name but are subtasks on different parent tickets, so this is a necessity. I wanted to add an update for how v2 is going to do this: the most sensible way possible. The "parent" will no longer be a column, but you will be able to expand and collapse subtasks for an issue. This reply was created from a merged topic originally titled Parent visibility for sub-tasks. I have really enjoyed using worklog assistant, however, I find that what I can see doesn't always give me enough information about the tasks. What I think would be useful is seeing the parent issue description in the subtask item. this would let me know what a subtask was related to. Similar to the way jira puts this information about the subtask when it displays a subtask. <em>This reply was created from a merged topic originally titled <a class="notranslate" target="_blank" href="http://support.worklogassistant.com/somanisoftware/topics/parent_visibility_for_sub_tasks">Parent visibility for sub-tasks</a>.</em> I have really enjoyed using worklog assistant, however, I find that what I can see doesn't always give me enough information about the tasks. 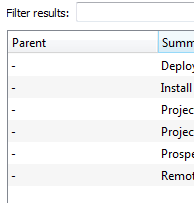 What I think would be useful is seeing the parent issue description in the subtask item. this would let me know what a subtask was related to. Similar to the way jira puts this information about the subtask when it displays a subtask.